In absolute terms this is not a novelty! The genius of the Italian Middle Ages was Leonardo da Vinci with its highest expression, even then he had built water clocks. And not less did nothing less than the Chinese. But it would come to build a wristwatch, fully mechanical, with indication of hours through the channeling of a liquid; this probably did not think even the great Tuscan genius. And ‘one of the innovations being an object of curiosity to the next Basel Watch Fair, scheduled from 8 March. 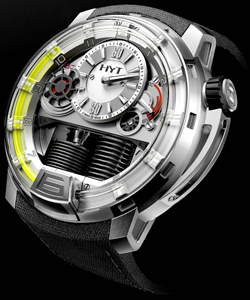 This authentic revolutionary realization will be presented by HYT, which will exhibit precisely the model H1, the first wristwatch time “liquid”. The pressure of the liquid in the channel around the dial is obtained through two small compressors. The minutes are marked with the traditional system of a needle placed in a quadrantino at 12 o’clock, 2 o’clock, while the dial is placed on the power reserve of 65 hours. A pleasant effect of operation is obtained with the visible movement of the wheel located at 10 o’clock. E ‘was also fixed the price of this gem: $. 45,000.00. Perhaps too many to even afford a miracle … the wrist.